Since the action was, shall we say, somewhat less than frantic, I had a fair bit of time to daydream (and there are now lots of studies (Jonah Lehrer self-plagiarism alert!) suggesting that daydreaming boosts creativity, helps solve complex problems, and is basically the best way to spend your waking hours!). Surrounded by virtually innumerable forms, envelopes, and cardboard ballot boxes, I fell into a reverie. In my reverie, I began to imagine a new and improved electoral process in Canada…and here’s what it started to look like. I hope there is a special place in hell reserved for pollsters—right next to the banjo strummers. The same goes for pundits, prognosticators, analysts, the crowd of “usual suspect” political scientists (oxymoron alert! ), spin doctors, and the rest. There might not be much that can be done about “fair and balanced” “news” organizations, but let’s just say—purely for fun—that the media are obliged to stick to “straight” reportage on platforms, policies, debates, etc; the campaigns are only allowed to extol the virtues of their own candidate (no saying bad things about the other candidate(s)) in their advertising; and the pollsters et al. can’t make a peep. Surely to God, there has to be a better way for people to vote. What is this, 1512? We’re barely beyond dropping coloured pebbles into a bag. People just might be more inclined to vote if it were even a smidge more “user-friendly”. For those of you who think this is a touch authoritarian, or some sort of intrusion into mythical and mysterious “individual freedoms”, all I will say is that if a country essentially founded by folks who had, at the very least, a few issues with authority can do it (you know who you are, Australia! ), why can’t we? Preferential ballots, some form of (mixed member) proportional representation, whatever it may be, there’s got to be a better way to express “the will of the people” in the determination of just who gets to toddle off to do whatever it is our elected representatives do with their days. Again–90 countries around the world do it…so why can’t we? At the moment, rural areas are significantly overrepresented and urban areas are significantly underrepresented. Regardless of where one lives, each vote should carry equal weight. Imagine that…a campaign sans polls, pundits, and attack ads; a better, perhaps even mandatory, voting process; a selection process that actually allocates representation in accordance with how people voted, and each vote cast carrying equal weight. I know there’s about as much chance of that happening as Penelope Cruz showing up on my doorstep tomorrow to whisk me away as her love slave, but I would gladly relinquish all claim to the latter for even a remote possibility of the former coming to pass. Short of a benevolent dictatorship with me as your glorious leader (and a selection of hand-picked friends as advisors), Winston Churchill was absolutely right that “democracy”, warts and all, is better than anything else we’ve tried as a species. He was also absolutely right about the best argument against it—but that’s why the average voter isn’t making public policy, thank goodness. It has also been said (variously attributed all over the place) that we get the government we deserve. Right now, we get pseudo-democracy because we don’t demand better. We all knew yesterday’s by-election was going to produce one candidate in the mid to upper 30s, another in the low 30s, and a third in the mid to upper 20s in terms of popular vote percentage—the whole whopping 30% or so of eligible voters who could be bothered to participate. The “winner” in such a scenario has a “mandate” from about 11% of the electorate. Regardless of political stripe, that’s simply a ludicrous and unacceptable way to select the people to govern our fair land. Sorry, but it’s just not good enough. Even if the average voter is the best argument against democracy, they’ve got to take part in it. And collectively, we’ve got to find a way to translate popular vote into representatives. I don’t have all the answers about mechanisms, implementation strategies, and all that good stuff. But we can work all that out. If we don’t, I fear it’s bread and circuses for a long time to come. For the first time in many years, I have been actively involved in politics for the past several weeks. When I say “actively involved”, I mean more engaged than simply paying attention and voting—although even that is, tragically, more “active” involvement than many folks seems to be capable of mustering. Background: I spent many years in radio journalism, where my job required me to maintain a certain distance from active political engagement. I then spent close to a decade living in the belly of the beast known as the United States, where my foreign student visa status prevented me from being involved. (Although many have been quick to point out that living in Berkeley, CA and Ithaca, NY isn’t exactly living in “real America”…but that’s another story.) Anyway, in 2004, my family and I moved “home” to Canada—specifically to Calgary. As such, Calgary was entirely terra incognita to me. As far as I knew, there lay dragons. I was pretty sure I knew that the social, cultural, political, and physical climates were going to be, shall we say, “challenging” for me. Boy was I in for a surprise! There are definitely days when the physical climate does indeed pose a challenge for my skinny self. But for the most part, that aspect of life is OK. On the social front, I have been blown away. We have met and made friends with an amazing bunch of people here—people with whom we share all kinds of interests, attitudes, and values. We don’t necessarily see eye to eye with absolutely all of them on absolutely everything, but one of my myths about “Calgary” was very quickly shattered and laid to eternal rest. Culturally, I have been even more amazed. The quality and diversity of what Calgary has to offer in every aspect of cultural life was astonishing from the day we arrived, and has only grown exponentially since then. There’s even starting to be some interesting architecture and design in the public realm (another topic for another day)! That leaves political life. At the community and municipal level, we have again been pleasantly surprised, to say the least. I don’t need to say anything that hasn’t already been said a zillion times or more about the last municipal election. Provincially and federally, it’s been another matter entirely, and that’s the only area where my stereotypical impressions about Calgary and Alberta have thus far been completely and utterly disappointingly confirmed…until now. Engagement in provincial and federal politics in Calgary—until now—has been a profoundly dispiriting exercise. Trudging off to the polling station to vote, knowing that regardless of whether you’re voting for someone/something or against someone/something , the outcome is as foregone a conclusion as it would be in North Korea made the entire exercise as pleasant and enjoyable as standing in line for stale pickles in Vladivostok on a pre-dawn January morning. But today, things are so entirely different that it’s hard to put into words. Today, there is a real opportunity to throw off the shackles of living in a single-party state. Today, it is not only worthwhile but incredibly exciting to be involved in federal politics in Calgary. I had met Chris Turner a few times before the campaign in Calgary Centre began. I can’t say we were friends, but we were acquaintances. I had read “The Geography of Hope” and some of his other work. While I didn’t agree with every word (we need to talk about New Urbanism vs. Modernism, Chris! ), I was extremely impressed with the quality of his research, the logic of his articulate arguments, and the elegance of his writing. I also agreed entirely with his focus on real, meaningful, and achievable solutions to many of the crises we face—whether we choose to acknowledge them or not. Bu the same token, I had been a member of the Green Party for several years. But, to be perfectly honest, I had let that membership lapse. I had become somewhat disillusioned and more than somewhat frustrated—both with the party and with the political process. I have been adrift, completely disenfranchised and virtually stateless, since landing in Calgary. Well before the by-election was really on anybody’s radar, I went to the Walrus Glenbow Debate on “Calgary’s Cowboy Culture: Living Legacy or Just History?”, where Chris and Chima Nkemdirim were facing off against—as it happens—Joan Crockatt and Mercedes Stephenson. I called it the “Massacre at the Max” (Bell Theatre, that is). Chris and Chima made powerful and articulate arguments, while Joan and Mercedes trotted out banal “conventional wisdom”. Remember—this is well before the by-election. I was not only highly impressed by Chris and Chima, but utterly appalled at the paucity of ideas and the inability to express them by Joan and Mercedes. Chris has taken some unjustifiable partisan heat for his recent Walrus magazine article about Calgary. I believe that the city is actually finally ready for an honest look at itself, and the Massacre at the Max confirmed that for me. When Chris announced that he was running, I was literally elated. Here at last was the kind of person I could support without reservation for political office—extremely well-versed in a broad range of crucial policy issues, a political “outsider” and not a “party hack”, extremely smart and articulate, and standing for public office for good and honorable reasons. When Joan won the CPC nomination, I immediately flashed back to the Walrus debate, and simply knew that I could not accept being “represented” by her. Simply negate every reason for supporting Chris from the preceding paragraph and add a bunch more I need not list for the explanation. Meanwhile, Harvey Locke and Dan Meades are both decent, honorable guys, but the bottom line is that they’re both too (in)vested in the existing problematic political parties and dynamics that have hijacked and arrested public discourse in Canada for far too long. As I said already, I am a lapsed Green Party member (and, for that matter, a lapsed Liberal and NDP member in various provinces as well). 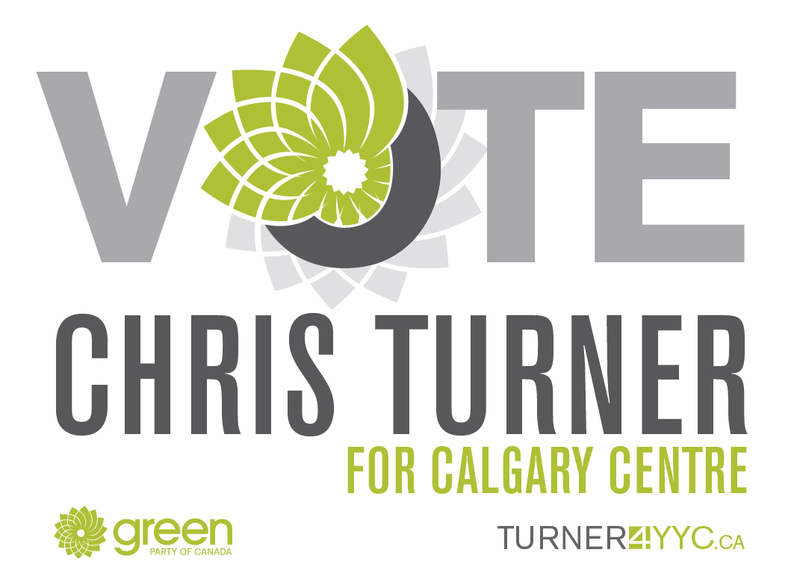 I am not voting for Chris Turner in Calgary Centre out of any party allegiance. I am voting for him—and doing what little I can to support his campaign—because he has ideas but is not an ideologue; because the “real”, diverse Calgary needs a diversity of voices in Ottawa and not a monolithic block of sycophants and toadies; and because we—not just Calgarians but all Canadians—stand to benefit tremendously from the reasonable, necessary, and positive perspective he will bring to public policy discussions and decisions. I will be working as a poll clerk on November 26th, so I will of course be entirely non-partisan that day. But before that day, I will do everything I can to support the Turner campaign. And I will look forward to a new political reality in Calgary after that day—a reality in which my voice in political conversation and (infinitely more importantly!) my actual vote are truly meaningful.